Exciting and extremely affordable – struck in the purest silver in the world! Celebrate the Year of the Snake with a true bargain, including a mintage limit and high face value – what’s not to love? The year 2013 is ruled by one of the most popular and auspicious of all the lunar zodiac signs – the clever Snake. The Snake personality is graceful and soft-spoken. It has a hypnotic beauty and never gives itself totally away. The mysterious Snake is a strategic planner that has everyone guessing its next move. It will keep plotting until it gets what it wants and when it does, it is not likely to let go! The Snake is a strong individual and is usually destined for great success. This cunning, clever animal. Is made all the more desirable by the Royal Canadian Mint’s new, realistically rendered snake pure silver. 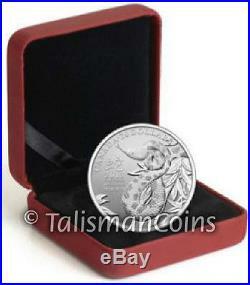 Dramatically depicted by the fine engravers at the Mint in precious silver! What’s all the fuss about, er, I mean, how do we love thee? Let us count the ways.. Lowest mintage to date. Half or less of any previous issue! Limited mintage – only 1 in 250 Canadians can ever own one! And what does that leave for the rest of the world? ! ? ! Significant precious metal content. Minted in the purest silver available in the world – only the Royal Canadian Mint strikes four 9s fine silver coins! Handsome specimen finish – unique to the RCM! Simple yet evocative artistry, an original work of art designed that realistically captures the essence of the snake! Year of the Snake. And this is far and away the least expensive pure silver Year of the Snake. With economists becoming more and more anxious about the rising debt levels of Western nations, the timing couldn’t be better. Think about the incredibly huge federal budget deficit, all the states’ financial problems, and the recent defaults in Europe. Well, here’s some relief – a precious metals coin with a high face value, too! It Simply Adds Up. Do the math: High Face Value + Significant Precious Metal Content + Wildlife Theme + Mintage Limit = No-Risk Winner. The Year of the Snake – Intelligent and Clever! Centuries ago, the Chinese invented a calendar based on the lunar (rather than the solar) cycle. There are twelve animals in the Chinese lunar zodiac, each corresponding in sequence to a year rather than a month. In 2013 we celebrate the Year of the Snake. According to tradition, people born during a Year of the Snake (1905, 1917, 1929, 1941, 1953, 1965, 1977, 1989, 2001, and 2013) are said to exhibit that animals attributes. Snake people often enjoy new ideas, innovative thoughts and progress, but some will reject advice from anyone but to themselves, although, most snake people are loyal friends and make great company. The Snake is strongly associated with deep mysticism, valuable wisdom, and knowledge. Most snake people are enigmatic, deep thinking, and maybe the wisest of all Chinese Horoscope signs. Most snake people enjoy learning, reading, and eating good food. They can also be concerned about their outer appearance. Best attribute is their excellent ability to communicate with others and successfully engage in interesting conversations. For the Chinese people, the snake symbolizes intelligence, happiness and auspiciousness. In certain parts of China people call the snake the dragon in heaven or celestial being. At Dangfu in East Chinas Anhui Province, people call the snake the dragon at home. The Royal Canadian Mint refines the purest silver in the world. The RCM is also the only mint in the world to issue commemorative coins in a. This one-quarter ounce silver coin is 99.99% pure! This coin features the uniquely-Canadian “specimen” finish, a three-fold combination of different finishes. The design (raised area or relief) includes both brilliant and mirrored surfaces, while the fields (background) are subtly striated, resulting in a contrasting, matte appearance. No other mint in the world employs the specimen finish. A sensational rendering of a camouflaged snake. Coiling on a tree perch that captures the animal’s mystery and hypnotic grace. The Chinese character for “Snake” appears to the left of the snake. The legend FINE SILVER 9999 guarantees the purity. The date and denomination are also indicated. Her Majesty, Queen Elizabeth II of England. In profile facing right. This portrait, the fourth effigy of the queen to appear on Canadian coinage, was executed by the artist Susanna Blunt. The date, denomination and the legend ELIZABETH II D. REGINA (Elizabeth II, Queen by the Grace of God) also appear. The coin is encapsulated inside a burgundy leatherette, clamshell-style presentation case, lined with black velvet and protected by a black outer sleeve. An individually-numbered certificate of authenticity is included. 9999 Fine (Pure) Silver. Talisman World Coins and Medals has been in business for more than 27 years and is one of the largest world coin direct distributors and wholesalers in the world. 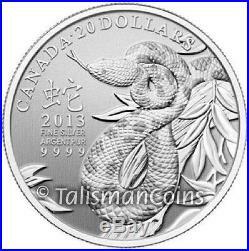 The item “Canada 2013 Year of Snake Chinese Lunar Zodiac $20 Pure Silver IN BOX FULL OGP” is in sale since Tuesday, October 30, 2012. This item is in the category “Coins & Paper Money\Coins\ Canada\Commemorative”. The seller is “talismancoins” and is located in Saint Louis, Missouri. This item can be shipped worldwide. Posted on August 19, 2017 by admin	in canada. Tags: canada, chinese, full, lunar, pure, silver, snake, year, zodiac.